Oregon Basketball Correspondent Jason Selby reporting live from the Matthew Knight Arena in rainy Eugene, Oregon. 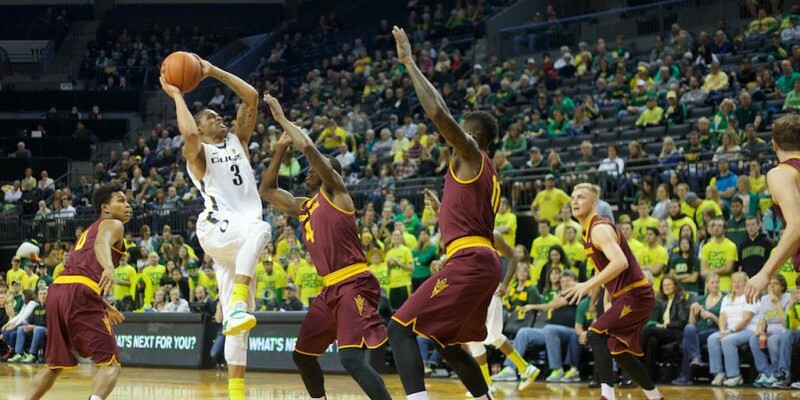 Following a tough loss to the No.7 ranked Arizona Wildcats, the Ducks of Oregon stepped back into Matthew Knight Arena to take on a tough Arizona State Sun Devils team. The arena, to the shock of some, was decently filled for the early afternoon start time. 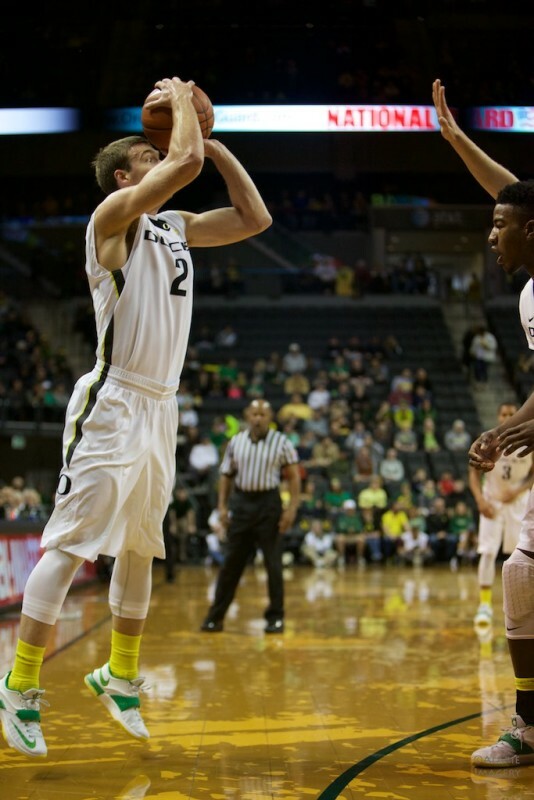 Oregon Guard Casey Benson attempting a corner three against Arizona State. Putting it simply, there was absolutely no tempo for either team on offense. Right off the bat, both teams struggled to move the ball and create opportunities. Four minutes into the game, the first sign of ball movement from the Ducks resulted in a corner three pointer by Casey Benson, followed by a massive block on the other side of the court by Jordan Bell. With this block (his 52nd of the season), Bell eclipsed the all time Oregon single season block record set by Tony Woods in 2012. The next ten minutes of play didn’t yield much from either side. Despite struggling to create shots and ball movement, the Sun Devils were able to stretch their lead to 20-14. At this point, it looked like the Ducks were going to continue the slow pace, as they often seem to do in the first half of games. But, thanks to the intense rebounding effort of Bell, with four minutes left in the half the Ducks were awarded a second opportunity on a possession that resulted in a Joseph Young corner three-pointer. The Ducks then responded on the opposite end of the court with great defense and the next time down the court, Benson floated a pass through the air to a soaring Bell for a massive alley-oop that quickly got the crowd on its feet. Following a Dwayne Benjamin lay-up, the Ducks took the lead at 21-20 capping off a run of seven points in just over one minute of play. Thanks to an increase in effort toward the end of the first half, the Ducks went to the locker room up 25-23. The Ducks came out a little quicker to start the second half, holding the lead for about four minutes. Massive Eric Jacobsen of ASU started causing issues for the Ducks. In the first half, Jacobsen went two for two from the field, and he quickly kept his perfect shooting percentage going as he scored nine points for the Sun Devils in the second half and thirteen overall for the night. He finished a perfect six of six from the field. After Oregon’s Young sank two free throws to give the Ducks the lead at 47-45, the Sun Devils went on a six to nothing run. At this point, they were leading Oregon 51-47. After a timeout, and Head Coach Dana Altman most likely ripping into his players, Oregon came out determined to take this game away from the Sun Devils. Freshman Dillon Brooks was fouled on a lay-up, ultimately leading to a three point play after his sinking the ensuing free throw. 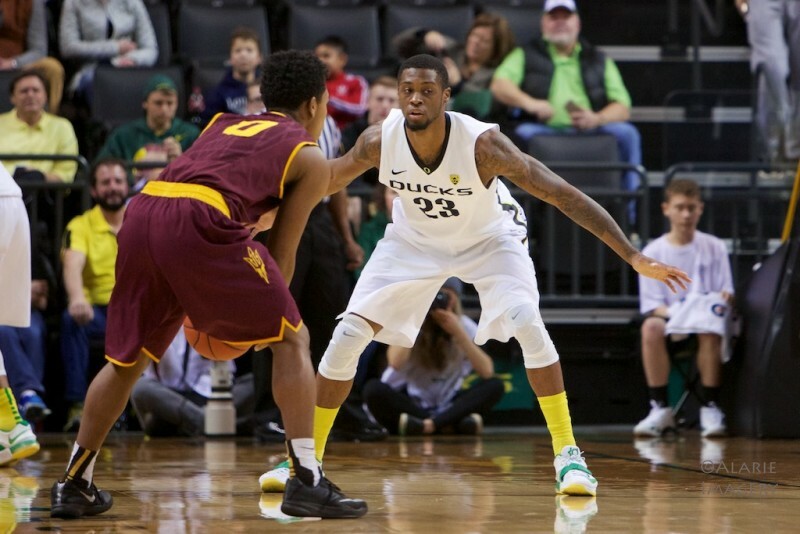 Following a free throw from ASU, Young marched his Ducks down the floor and made a huge three pointer, giving Oregon the lead. After Young’s three, ASU’s Shaquielle McKissic was fouled and hit both free throws, giving the lead back to the Sun Devils late. Elgin Cook playing some defense against Arizona State. With 1:45 left in the game, Bell followed up a missed shot by Elgin Cook with a layup that tied the game. As the Sun Devils took the ball back down the court, Young made a huge steal, leading to a fast break lay up for Bell. After the fast break, the Sun Devils took the ball back down the court, this time turning the ball over with eight seconds left on the shot clock. Bell reacted with a thunderous scream and so did the crowd. The Ducks stretched the lead to four points, and this proved too much to overcome for the Sun Devils. Final Score: 59-56, Ducks. The game ball must have been handed to Jordan Bell for his excellent performance in this game. Bell finished the game with a season high eight blocks, and — as earlier mentioned — his first of eight in this game broke the all time Oregon single season record. Bell finished with eight points, eight blocks, and six rebounds. When asked post-game about whether this was the best defensive performance of his career, Bell responded by saying, “I played well tonight on defense and I seemed to have found my role. And no, I actually had 28 blocks in a game back in high school.” Yes, you heard that right, he had 28 blocks in a single game. The sky truly is the limit for this kid. Up next, the Ducks will fly to Pullman to take on the Washington State Cougars. That game is not until Thursday, so the Ducks will have a few days off to work on some things and watch the football team compete for a National Championship on Monday. The Ducks certainly have a lot to work on, as tonight’s game showed. The team is young, and for all intents and purposes, still very raw. But, they showed a lot of promise and if Coach Altman can figure out a way to piece it all together, the Ducks will be a formidable force throughout the rest of Pac-12 play. Stay tuned to FishDuck.com for all the latest Oregon Ducks sports news.